I have written in these pages a number of times about the works of Richard Prosch. Until recently he has written mostly in the Western genre—his stories and novellas featuring the adventures of John Coburn, the Peregrine; his Holt County series featuring deputy marshal Whit Branham; and his delightful turn-of-the-century YA tales featuring inquisitive Jo Harper and her pal Frog. His short story “The Scalper” won a prestigious Spur Award from the Western Writers of America. 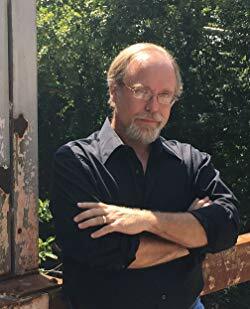 Like most writers, however—and in spite of admitting he maintains an “itch” to do more Westerns—Richard also seeks to flex his writing muscles and expand into other genres now and then. Toward this end, he has done work in horror, science fiction, and contemporary crime. Most recently, Richard has launched a PI-like series featuring Dan Spalding, a former investigator for the Missouri Highway Patrol who nowadays runs a used record store in touristy Ozark City (think Branson, MO). Naturally, Spalding's background and his knack for attracting trouble, keeps getting him involved in “cases” where he needs to call on his old skills and a growing cast of colorful secondary characters to help set things right. So far Dan has appeared in the short story “Spalding's Groove”, the novellas ANSWER DEATH, FLIP SIDE, and the just-released BACK MASK. So what about the man behind these tales of the Old West and modern-day mayhem? In conjunction with the release of BACK MASK, I got Richard to sit for a lengthy, enjoyable phone conversation and then agree to answer some questions about him, his life, and his writing. DUNDEE: Your formative years, up until you went off to college, were spent on a farm in northeast Nebraska. I know that, to a large extent, part of your heart still resides in Nebraska and you have used it as the setting for many of your stories, particularly the Westerns. Will you please comment further on that—your growing-up years, what impact/influence, if any, it had on your writing? Did you have writing aspirations back then? If so, did you get any encouragement from parents, teachers, friends? PROSCH: I logged a great many hours under the wide open sky with not a lot to think about except the stories I would make up. So the environment, the landscape, contributed a lot to my imagination. I can’t say my family paid much attention to my writing, but I had a fifth grade teacher who did. I wrote a vampire story where blood “billowed out from the victim’s neck like scarlet ribbons.” Mrs. Neuharth wrote in the margin, “Gross! But I love it! You could be a writer someday!” With that positive feedback, I was hooked. I’ve often given Mrs. Neuharth credit, and I will here again. I wouldn’t be doing this without her. DUNDEE: In college, you met your lovely wife Gina. (Congrats, by the way, on just recently celebrating your 30th year of marriage!) I believe you were studying Graphic Art, with an English minor. Judging by the critical role Gina now plays in your current writing and self-publishing career—cover design, print layout, and soon to be co-author—it seems obvious that you certainly get support there for your writing. The two of you also are home-schooling your son Wyatt, who is gaining local and perhaps national prominence in the world of figure skating. The three of you have a very busy yet very close, enviable family dynamic. Can you expand more on that, please—your family/working relationships, the schedule balancing that must be required, etc. PROSCH: Gina’s answer would be “we work our butts off,” which is more or less true. She’s being funny, but it’s no joke. And by work, she means we put in the time. It’s that simple, and that hard. All the successful people—I mean truly successful--I’ve ever known have that in common. They put in the time. Whether it’s at the keyboard, the musical instrument or the personal relationship. Early on, we found ways as a family to double-up on the time we spent together. For example, we wouldn’t be able to homeschool without a home office. DUNDEE: Growing up, your father was an avid reader of science fiction and so you also read a lot in that genre. Your grandfather, you told me, read a lot of paperback Westerns. I don't recall you saying whether or not you read many of those. But in your writing career to date, you've done very little in the way of science fiction yet, as detailed in the introduction, quite a lot in the Western field. Most writers tend to write, at least in the beginning, what they were fans of reading. Why do you suppose that wasn't the case with you? PROSCH: I think westerns offered a fresh landscape to explore. Also, I started writing westerns with more enthusiasm after Wyatt was born. I wanted to get him grounded in his family’s Nebraska history, and our own Wyoming experience. As we explored the real-life west, the stories just naturally developed. That said, I loved westerns on TV growing up—The Rifleman in particular. DUNDEE: Who were some of your favorite authors growing up? Are there current authors you follow regularly and/or whose work you find particularly appealing? PROSCH: Harlan Ellison, Ray Bradbury, Robert Heinlein—those guys eventually gave way to John D. MacDonald, Robert B. Parker, Steve Frazee, and others. The list goes on. And there are writers I used to like that I can’t look at now. Vonnegut is one. And some that I judged too harshly. Even now though, I would have to put Ellison and Bradbury at the pinnacle—for their flat out passion for the craft. DUNDEE: Your Westerns tend not to fall so much into the “shoot-em-up” variety. While there certainly are some bad hombres and a fair amount of violence—especially in the Peregrine stories, inasmuch as Coburn is a renowned gunman—the action is not overly graphic and it usually happens for a reason and comes with consequences. The characters in your stories, good and bad alike, often come across as people just doing their jobs (even if those jobs sometimes fall on the wrong side of the law) in order to try and get by in a hard land during a hard time ... Simple, common folk, in other words, as opposed to the larger-than-life, over-the-top kinds of heroes and villains often found in the genre. How deliberate is that on your part? Or is it merely a by-product of the stories that come to your mind? PROSCH: It’s absolutely deliberate. I like stories about everyday life and how, without much warning, a domino falls over and things go on from there. My heroes have always been the unassuming people who—without fanfare or notice—stood up and started putting things back to rights. DUNDEE: Dan Spalding is an immediately engaging character in a distinct setting surrounded by colorful secondary characters. He seems to have appeared fully realized in your initial story “Spalding's Groove”. Given his training and instincts, it seems perfectly logical for him to get involved in the kind of matters does, yet you cleverly avoid the stereotypical trappings of a straightforward PI set-up. Again, how calculated was this? What was the genesis for Spalding? PROSCH: Gina says Spalding is my alter ego. Maybe he’s somebody who I might like to be if I had a second run at life. Every day I’m inspired by friends in the law-enforcement community, the EMS guys, the first responders, the firefighters—the people who make a real difference and pave the way for the rest of us. But there’s no way I could stand the bureaucracy, and neither can Dan. He needs to run his own ship, his own way, and right there he’s at odds with half the world. I’ve had some experience with that too. DUNDEE: Records and the music industry—current and old—play a big part in the Spalding books. Are you a pretty thorough records/music nut in real life, or do you have to do a lot of research for the facts and observations these stories are built around? PROSCH: My mom had this fantastic record collection that I cut my teeth on, and the passion grew from there. I used to record songs from the radio on my portable cassette player, and I was a faithful reader of Song Hits and Creem all through school. A friend once turned me on to jazz and heavy metal and classic country music—all in one summer—and challenged me to write for Rolling Stone magazine when I graduated. I’ve lost track of him now, but when I write the Spalding stories, I think of my friend and my mom and hope I’ve somehow done them proud. DUNDEE: I know that you follow and support the work of Andrew Vachss, both his writing and his life's work of protecting and fighting for the rights of the vulnerable and abused in our society. I know how strongly your personal feelings are in this area and now a theme of protecting/aiding the vulnerable seems to be running through the Spalding books. Care to comment further on this? PROSCH: Yeah, I don’t think that was planned as much as it developed naturally from some experiences in my own childhood. Watching my son and his friends deal with the culture we now live in really brought home those memories and sense of responsibility we all should have. I mean, it’s a shame that so many people spend so much time kvetching about issues that absolutely don’t matter. Television and sports and petty political beefs come to mind. Meanwhile they’re out to lunch on child abuse, neglect, abandonment, trafficking—all the vile things going on around them every day. The next Spalding book, STAGE FRIGHT, will deal with some of that in a direct way. DUNDEE: You, like me, seem to have fully embraced the eBook/self-publishing movement and you have received wide acclaim for your work. What do you see for the future of the business? And what can readers expect, in the future, from Richard Prosch? PROSCH: I think the Indie movement will continue to grow and improve. It will change, as all things do, and some folks will drop out. For me it’s a chance to share a story more quickly and move on to additional ideas. DUNDEE: It's always a pleasure talking with you, Rich. I really appreciate your time and cooperation for this interview. I think readers will enjoy it and will come away knowing a little more about Richard Prosch and his work. In closing, if there's anything I failed to ask about that you would like to comment on, please feel free to do so now. And thanks again. PROSCH: I’ve been posting free stories on my blog this summer, and that will continue indefinitely with a crime story on the first Tuesday of the month and a western two weeks later. It’s a fun way to revisit some work that might’ve gotten lost and share something with a new reader without asking them to part with any cash up front. I’ve picked up some new readers that way and come up with new story ideas too. So be sure to stop past www.RichardProsch.com every few weeks. I also want to let you know how much I appreciate the interview and your kind words of encouragement, Wayne. Writing is a terrific endeavor and one of the best parts is the friendships you make along the way. Thanks for a fun interview! 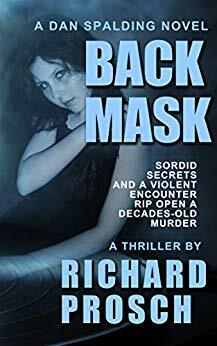 For readers already familiar with Richrd's work, be sure not to miss the just-released BACK MASK, now available in eBook and print through Amazon. You can catch up with all of Richard's work via his Amazon page, his blog, or on Facebook. I urge you to do so, you'll be in for some fine reading. Good stuff. He's a top writer.